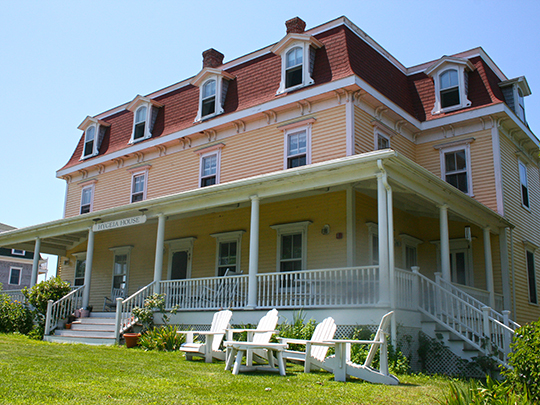 New Shoreham Town Hall is located at 16 Old Town Road, New Shoreham, RI 02807; phone: 401-466-3200. Photo: Hygeia House Hotel, ca. 1885, Beach Street, New Shoreham (Block Island), RI. Listed on the National Register of Historic Places in 2001. Photographed by user:Pvmoutside (own work), 2011, [cc-by-3.0 (creativecommons.org/licenses/by/3.0)], via Wikimedia Commons, accessed March, 2016. The Town of New Shoreham is coextensive with Block Island and is the least-populas municipality in the State. New Shoreham was incorporated in 1672. Block Island is in the Atlantic Ocean, dominating the eastern entrance to Long Island Sound. The nearest land is the south shore of Rhode Island, nine miles northward. Its shape resembles a pear, and its surface presents a series of undulating terraces gradually descending until, at the shore, they sink to the water's edge and shelve into the sea. The marine climate of the island is cool and healthy, and the temperature quite even, remaining during the summer days near the middle 60s, or 10 degrees lower than that of the mainland. Winter temperature, on the other hand, remains about 10 degrees higher than that of the mainland, hovering near the freezing-point. The island has three striking features, low hills, a great many ponds, and a lack of trees. Though it was covered with forests when visited by the early navigators, there have been few trees on it for a century or more except those that have been carefully nursed and cultivated. Alton stony loam occurs in large patches all over the island; it is porous in character and its loose subsoil allows rapid drainage. When cultivated, it produces fair crops of potatoes and early vegetables; otherwise it supports wild grass and dense underbrush. The naturally vigorous and productive soil is, however, full of granite boulders and pebbles. These have been utilized in the construction of stone walls, with which the little farms all over the island are fenced. The agricultural products have not been sufficient to support the population, though the soil has been well nourished by the liberal application of fish offal and seaweed, which is cast upon the shores by the sea and gathered by the farmers. There are 365 fresh-water ponds on the island, fed by springs, some of them reaching a depth of 60 feet. The Great Salt Pond, covering more than 100 acres and cutting the island almost in half, is the only salt pond. Many of these bodies of water cover deposits of peat, evidence of a former age of great vegetation. Before the days of dependable transportation assuring supplies of coal, peat was dug from the bogs and dried for the winter's fuel supply. The numerous lakes abound in perch, pickerel, and bass, and the fishing grounds off the island are famous for record catches of tuna, swordfish, bluefish, cod, and other varieties. Fishing is the main industry of the town, and from its sheltered harbors sail over 100 modern fishing vessels that catch and ship annually over 30,000 barrels of fish to the markets on the mainland. Block Island has today won fame among gourmets as the home of a succulent species of swordfish, but is more generally known as a summer resort. The annual incursions of the mainlanders have not robbed the inhabitants of their character. The hardihood of the fisherfolk and the sailors is still evident, and the mores of an insular colony remain constant. Manhood, for instance, is determined not by legal age but by the first fishing trip. When a stripling passes this initiation, he takes to smoking a corncob pipe and is recognized as a man, no matter what his age. The islanders, to a greater degree than is found in other parts of New England, are cold and reserved toward a stranger, but extremely hospitable once they have accepted him. A friendly call on Block Island is considered an insult if it lasts less than three hours. Block Island was at one time inhabited by a tribe of the Narragansett Indians, who called it Manisses (Manitou's Little Island). The first view of the island by European navigators is a matter of conjecture. The Vikings may have cruised along its coast, but nothing definite was known of the place until Verrazano, an Italian navigator exploring for France, discovered its shores in 1524. His report of this visit, in which he compared the island to the Island of Rhodes, gave rise to the State's name. The first European known to have explored the island was the Dutchman, Adriaen Block, who came in 1614. He mentioned finding here a numerous tribe of Indians, who received him and his crew very kindly, and regaled them with hominy, succotash, clams, fish, and game. Block named it Adriaen's Eyland, but custom has given and preserved to it the simple appellation, Block Island. Probably the first Englishman who contemplated settling on the island was John Oldham, who, with two white boys and two Indians, touched here in 1636, on his return from a trading voyage to the Connecticut River. The Indians of the island attacked the vessel, killed Oldham and captured his companions. Out of this and similar tragedies grew the Pequot War of 1637. In 1658, the General Court of Massachusetts granted the island to Governor Endicott and others, who in 1660 sold the island to 16 individuals; these had it surveyed and they established a settlement on it in April, 1661. They divided the island into three parts, the northern, the western, and the southeastern, numbering and apportioning the sections to individual owners; the size of the allotments depended upon the quality of the soil in the division. In 1672, the Rhode Island Assembly, under whose jurisdiction the settlers wished to place themselves, voted that "at the request and for reasons by the inhabitants showed, and as a sign of our unity and likeness to many parts of our native country, the said Block Island shall be called New Shoreham, otherwise Block Island." Within and around the island there has been much hard fighting. In July, 1689, a bark, a barge, a large sloop and a smaller one, constituting three men-of-war and a transport, made their appearance in the bay on the east side, greatly alarming the inhabitants, who had no means of knowing whether the ships were English or French, friend or foe. Brave though they were, uncertainty filled their hearts as they stood and watched the vessels come to anchor, and saw a boat lowered and head for the shore. When the boat came near enough, one of the occupants stepped out upon a boulder, picked his way across the intervening rocks and, in English, greeted the natives in a friendly manner. The islanders took no chances, however, and while questioning him closely, kept their guns ready for self-defense. The visitor gave his name as William Trimming and convinced his questioners that the vessels were under the command of George Austin, a noted English privateer with whom they were friends. He said they were in need of wood, water, and a pilot to conduct them safely into Newport Harbor. When he had succeeded in gaining the confidence of the islanders, he returned to his ship and soon made a signal for a pilot. With visions of a substantial reward, several immediately went aboard, only to be promptly imprisoned. Threats of bodily harm forced them to tell all they knew about the island's defenses. Upon receiving the information, the masquerading French privateers lowered three boats with 50 men in each, and landed on the shore. They overpowered the islanders, imprisoning them in the stone house of Captain John Sands. The island became the prey of Trimming and his followers, and, according to the Reverend Samuel Niles, an eye-witness, "they continued about a week on the island, plundering houses, stripping the people of their clothing, ripping up the beds, throwing out the feathers, and carrying away the ticking." When news of the invasion reached the mainland, two vessels were fitted out at Newport under the command of Captains Thomas Paine and John Godfrey. On arrival at Block Island, they learned that the enemy had left to attack New London, so they pursued the Frenchmen, and on Fishers Island, in Long Island Sound, surprised the enemy and killed the deceitful Trimming. During this turbulent period the principal surgeon and physician on the island was a woman, Sarah Sands, believed to have been the first woman doctor in the English Colonies. She died at Block Island in 1702. Privateers continued to come to the island for plunder, and from 1698 to 1706 it was in a state of almost continual siege. In 1706, the Governor and Council of Rhode Island reported as follows: "We have been this summer as well as the last obliged to maintain a quota of men at Block Island for the defense of Her Majesty's interest there." Meanwhile another hostile demonstration was made against the island, but at this final attack, occurring during the war between England and France, the islanders met the enemy in an open pitched battle, and drove them off from the shore with no one receiving any injury "except one man slightly wounded in his finger." During the Revolution, deserters and criminals found Block Island a convenient refuge, and once here they were not easily detected by the officers of justice, as communication with the mainland was so restricted. They were desperate characters from both armies, a scourge to the island, unprincipled and cruel in their demands. As a protection against these invaders, the people of the island kept a barrel of tar, or oil, on Harbor Hill and another on Beacon Hill, ready to be burned as a signal of approaching refugees. As soon as the signals were seen, the shores were picketed by the islanders, and in many instances the marauders got more than they came for. In July, 1780, messengers from the Rhode Island Colony landed upon the island with authority to take all the horses, cattle, grain, fish, and cheese that, in their opinion, could be spared by the inhabitants, and for the same to give certificate to the owners for future adjustment. These certificates, however, were no better than receipts for a levy on the island for supporting the war, unless the amount taken should be proved to be more than a just proportion of a State tax, in which case the surplus was to be credited on the next tax assessed. Thus the islanders, besides suffering the depredations of the British, were denied commerce with the mainland, were unrepresented in the General Assembly of the State, unprotected from the enemy, and burdened with a heavy tax. When in May, 1783, the messengers of the General Assembly read the news to the islanders that all rights, liberties, and privileges of other citizens of this State were restored to them, and all restrictions of travel and traffic removed, there was great rejoicing and thanksgiving. Block Island enjoyed a sort of extra-legal neutrality during the War of 1812, which brought the islanders considerable prosperity. They were not only free from military duty and tax, but were able to market their produce at a high price to English men-of-war. From early Colonial times the need of a good harbor on the island had been felt. Previous to the construction of the present harbors and breakwater, landing through the surf in small boats was difficult and dangerous. Between 1680 and 1762 attempts were made to cut a passageway from the sea to the waters of the Great Salt Pond, but owing to the force of the shifting sands and currents no permanent entrance was effected. Three appropriations were made between 1870 and 1872 for the construction of a breakwater and harbor on the east side of the island. Work on this port, Old Harbor, was begun in October, 1870, and completed in November, 1878. New Harbor, on the west side, was completed in 1900. The construction of these harbors has facilitated accessibility to the island, and has been of great aid to the fishing and shipping industry. Probably no one feature, except harbor protection, has given the area so great an impetus as the telegraph connection with the mainland. The cable extending to Point Judith was laid by the Federal Government in 1880. Popularly believed to be a hiding-place for treasures buried by Captain Kidd and his followers, the surface of the island has often been dug over by enterprising treasure-seekers. It is rumored that some booty has been found. Federal Writers' Project, Works Progress Administration, Rhode Island: A Guide to the Smallest State, The Riverside Press, Cambridge, Houghton Mifflin Company, Boston, 1937.